Six days a week, almost without falter. That’s how often you’ll find Fred Wilkerson working out, which is why we’re proud to announce that he’s Rock Creek Sports Club Member of the Quarter! Fred says he hears the excuse “I don’t have enough time to workout,” all the time, and he just shakes his head. And that’s exactly what Fred does, and has been doing most of his life. 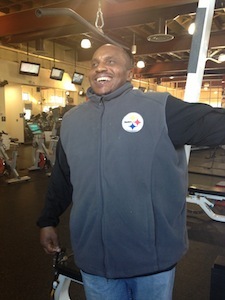 After Fred’s gym closed down about 3 years ago, he needed a new place to workout, and that’s when one of his friends recommended he try out Rock Creek Sports Club. Fred said he loved the atmosphere of Rock Creek, and he’s been coming back ever since. So next time you’re in the gym, and spot Fred, who will be doing anything from lifting weights, conditioning, or getting his ab workout on, make sure you congratulate him for his Member of the Quarter award!